Special diets are a hot topic in the catering industry these days - and I'm not talking about South Beach vs. Atkins. Many people have dietary restrictions, including sugar-free, gluten-free and vegan, and why shouldn't they get to eat cake at their own wedding? Many cake bakers in North Florida recognize the importance of dietary restrictions, and have cake options for their clients. Gluten-free cakes require that equipment and supplies be kept separate from gluten-containing products, and the work surface must be sanitized thoroughly. Diabetic cakes often replace sugar with agave nector, fruit purées, honey, maple syrup and evaporated cane juice. Vegan cakes will not have diary or egg products. Alternative dairy products are used, such as soy, rice, oat, coconut and almond milk, soy butter, and coconut oil. If you have a special dietary restriction, you may consider ordering a small cake that can be placed near the traditional wedding cake. Or, ask your cake baker about a dummy cake! Many cake bakers can make a cake of Styrofoam and fondant, making it look very real. Then they can add a small layer of cake made especially for you, which you can cut during the reception. Then, the guests can be served from sheet cakes that are stored in the kitchen. This way, you get to cut your wedding cake and eat it, and your guests can enjoy a more traditional cake recipe. If you have close family members or friends that have dietary restrictions, some may recommend having special cupcakes for them. While this is nice, it often draws attention to the fact that they have a special need. Consider having a small cake in the back and alerting your caterer to those that should be served the special cake. 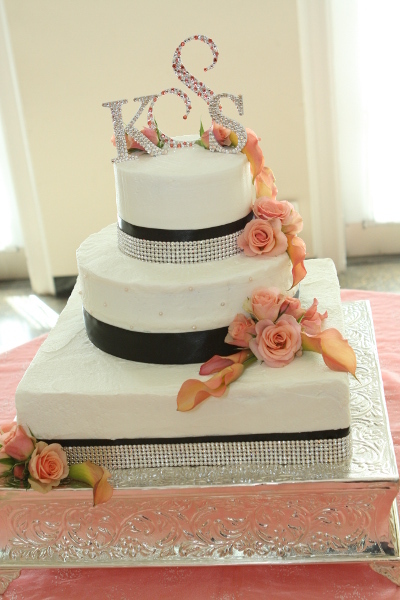 The pretty cake featured here is from one of our past weddings, and was created by Simply Delicious! Cakes - they offer a variety of special diet cakes in North Florida.